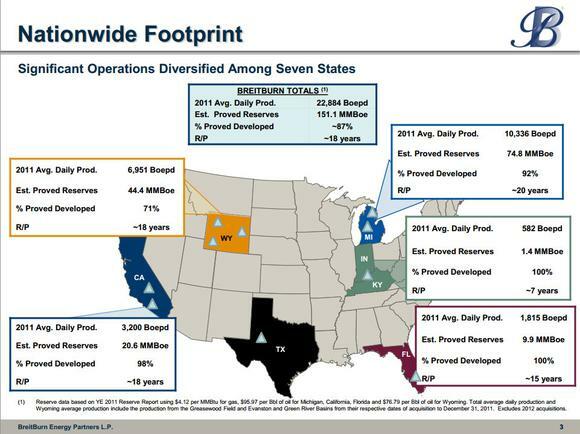 Reserves are the lifeblood of an energy production company, but they matter even more if you're an upstream MLP like BreitBurn Energy Partners . Most traditional exploration and production companies reinvest a majority, if not all, of their cash flow to explore for new sources of production in order to offset the natural decline of current production. Companies like BreitBurn instead send that cash back to investors. That's why it needs to be smart in buying assets that have a long reserve life that are also not in rapid decline. Let's take a quick look at BreitBurn's reserves and see how they stack up. BreitBurn had an estimated 151 million barrels of oil equivalent in reserves at the end of last year. Those reserves are spread across seven states and are estimated to last about 18 years. The company's production is split evenly between gas and oil. Not all of its assets are of equal importance to the company so let's take a closer look at segment. The assets lumped into BreitBurn's northern division includes the Antrim Shale, New Albany Shale, and its Wyoming assets. The company's Antrim Shale assets in Michigan make up the greatest portion of reserves at about 35% of the total. These primarily low-decline natural gas assets that are fairly predictable. Investors can expect the company's more than 3,600 wells to produce for an average of 16 years. These are solid MLP-type assets, which is why it's no surprise that fellow upstream MLP LINN Energy also owns assets in Michigan. LINN's asset base is a much smaller portion of its overall reserves at less than 6%. The key here is that these are low-decline natural gas assets that are a good fit from an upstream MLP. In addition to Michigan, BreitBurn has just over 250 wells in Indiana and Kentucky that are dedicated to the New Albany Shale. These just have an average reserve life of seven years and make up a very small portion of the company's asset base. In Wyoming on the other hand, BreitBurn has a very large asset base, second only to its Michigan assets. These assets add an oily component to its production mix. Just last year the company spent $95 million to acquire a 100% oil asset in the Big Horn Basin. When you add in its crude oil producing Powder River Basin assets to the gassier Green River Basin assets you get a nice mix of production. These days the oilier the production you can get the better; however, given how well-hedged upstream MLPs are, it's not as critical. BreitBurn's southern division produces out of three states: California, Florida, and Texas. Of the three, its California assets are its largest. California oil assets are among the best assets for an MLP to own because of the low-decline rate. That is one of the main reasons behind LINN Energy and its affiliate LinnCo's deal to buy Berry Petroleum . Nearly half of Berry's production was is in California which prompted an analyst on the company's conference call to congratulate the company on a great deal because "California assets aren't easy to come by." BreitBurn completed its own California deal last year, spending $40 million in cash and 3 million units to boost its reserves in the state. These are great cash flow assets for the company and a perfect fit for its MLP structure. The only problem, if you want to call it that, with California assets is that they are lacking opportunities for production growth. That's what makes the company's strategic entry into the Permian Basin last year even more exciting. The Permian assets come with a lot of upside. The two separate deals, totaling $218 million, not only brought the company 40 very liquids-rich wells but the assets came with 160 future drilling locations. The acquired wells have an estimated reserve life of more than 13 years and are in the heart of one of the most attractive liquids plays in the country. The Permian Basin is a great place for BreitBurn to be, as it not only offers liquids-rich production growth, but also a lot of bolt-on acquisition opportunities as other companies with non-core positions look to cash out. The final BreitBurn assets in its southern division are those in Florida. The company has 19 producing wells across five fields that yield 100% oil. BreitBurn has about 10 million barrels of oil equivalent of reserves in Florida which have an average reserve life of about 15 years. Again, you want to see long-life assets like these in an MLP's portfolio, especially the oily kind. When you add it all up, BreitBurn certainly has the reserves it needs to continue to deliver its distribution to investors. However, production with these assets will decline over time, which is why the company will continually need to acquire new assets as well as grow organically. Last year it budgeted to spend $68 million on production growth projects. Before the year had ended, it spent more than $150 million on these projects. The overage wasn't because of skyrocketing expenses, the company simply saw more opportunities to invest capital. The company still has plenty of development opportunities at its legacy assets. Looking further ahead, BreitBurn does have some future optionality from its 130,000 net acres in the Utica Collingwood Shale,and 75,000 potential net acres in the A-1 Carbonate. Others in the industry are currently drilling test wells in both plays; if successful these could represent significant upside for BreitBurn's future. Taking everything together, the company has enough reserves to secure its current distribution of more than 9% for years to come. The company also has a nice inventory of organic growth projects slated for the future, as well as the financial flexibly to continue to acquire additional reserves. This has given management the confidence to target a 5% annual distribution increase. When you add it all up, BreitBurn has the solid foundation you want as an income-seeking investor. There's enough potential here for me to give the company an outperform rating in my CAPS profile. Despite the reserves, BreitBurn's distribution still might seem too good to be true for you. If you're on the lookout for other high-yielding stocks, The Motley Fool has compiled a special free report outlining our nine top dependable dividend-paying stocks. It's called "Secure Your Future With 9 Rock-Solid Dividend Stocks." You can access your copy today at no cost! Just click here. The article Adding It All Up: Why BreitBurn Energy's Reserves Matter originally appeared on Fool.com. Fool contributor Matt DiLallo owns shares of LINN Energy, LLC and LinnCo, LLC. The Motley Fool has no position in any of the stocks mentioned. Try any of our Foolish newsletter services free for 30 days. We Fools may not all hold the same opinions, but we all believe that considering a diverse range of insights makes us better investors. The Motley Fool has a disclosure policy.